Margaret C. McIntyre is a talented artist and art instructor. 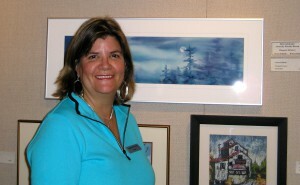 The majority of her work consists of watercolour landscapes depicting both Canadian and Caribbean scenes. Many of her creations depict the beautiful Haliburton Highlands and farmlands of Ontario as well as the gorgeous scenery of Antigua. Marg works in all mediums but her passion is watercolour. Her watercolour paintings are beautiful, colourful, and fresh with just the right combination of detail and looseness. Her goal is to have her brush touch the paper only once, twice at the most. She loves to “drop” in colour and watch it “bleed” into the painting. Her paintings are hung in private homes all over the world. Marg is in high demand for her step-step-step workshops. Thousands of students, of all ages, have enjoyed creating beautiful pieces of artwork in her enjoyable and relaxed atmosphere.